If you’re a “glass half full” kind of person, then every day seems like Christmas. There’s absolutely nothing wrong with that, especially if the company you work for decide to have their Christmas function in January. For lifes’ natural optimists, the opportunity eat, drink, dance and generally make merry a month after Christmas is definitely a highlight – especially if it includes getting on the dance floor to the sounds of Hard to Handle. We found lots of lifes’ natural optimists at Avon Gorge Hotel in Bristol earlier this month in the form of the good folk at AMI Plastics, who hired us based on the music and sounds they found on this here website. They went through exactly the same process you’re probably going through right now – they found us online, watched our videos (view them HERE), listened to our MP3s, and crucially read our reviews on our Testimonials page, plus our Facebook page and Google reviews. Having hired us, the other good thing the guys did was ensure that the managers led by example – getting themselves onto the dance floor as quickly as possible and encouraging everyone else to do the same. 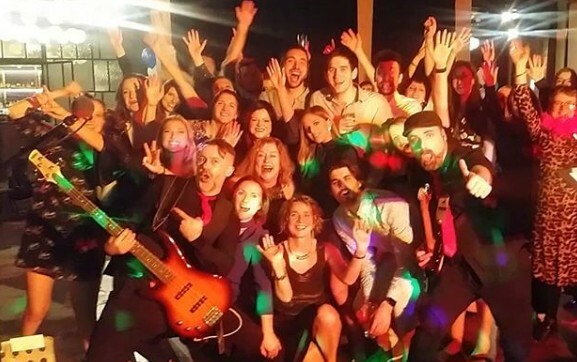 Regardless of whether you’re holding a business function or planning your wedding reception, it’s a really good idea to make sure your crew have been primed to show your other guests how to enjoy themselves!